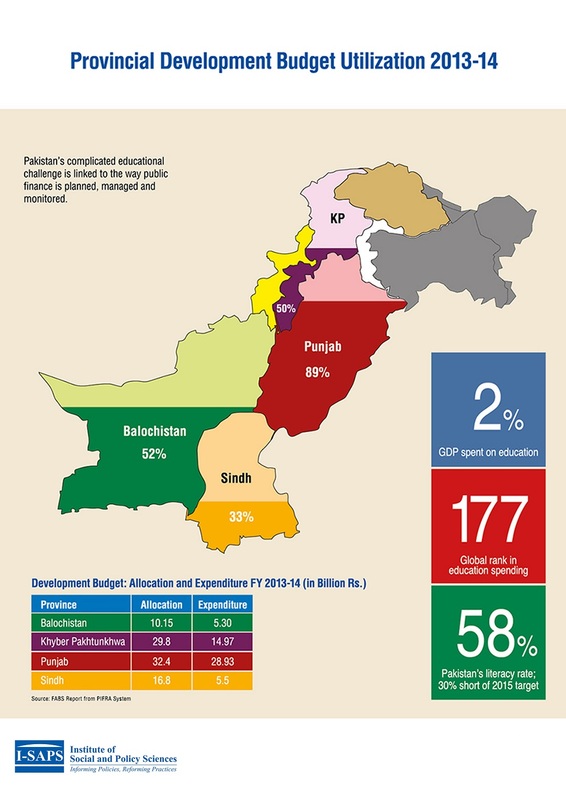 An increase of 11 percent has been recorded in the Federal education budget for 2016-17. Major portion of the Federal education budget goes to Tertiary Education Affairs and Services. Punjab government has allocated a budget of Rs. 313 billion for education in 2016-17. 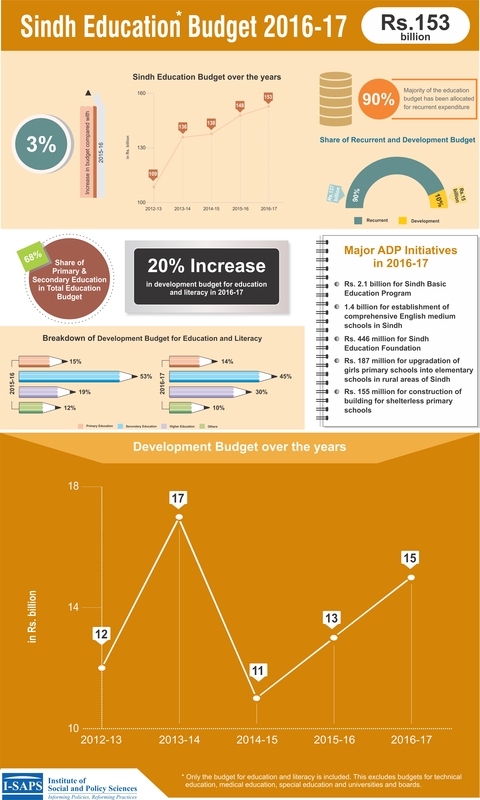 A major highlight is the 43 percent increase in development budget for education. KP government has allocated a budget of Rs. 143 billion for education in 2015-16. The share of school education has increased from Rs. 104 billion in 2015-16 to Rs. 119 billion in 2016-17. Balochistan government has earmarked Rs. 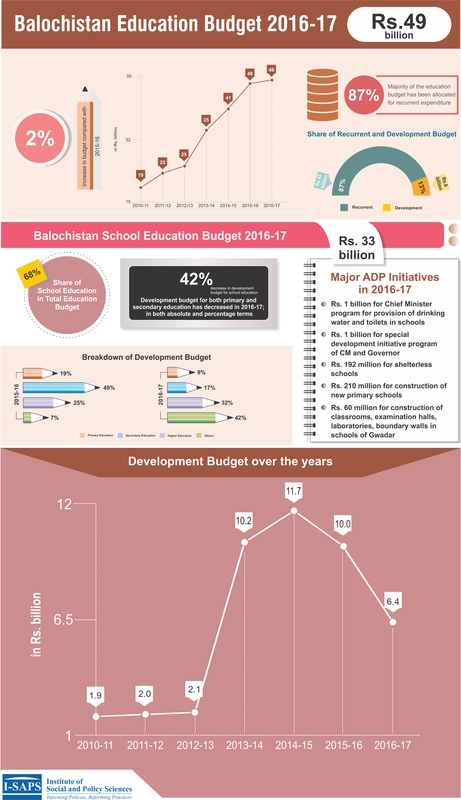 49 billion for education in 2016-17; 17 percent of its total budget. The development budget for school education in 2016-17 has decreased by 42 percent. Sindh government has earmarked Rs. 153 billion for education and literacy in 2016-17; an increase of 3 percent over last year’s allocation. Development budget has increased by 20 percent. Major portion of increase in education budget is absorbed in current budget (within which salaries receive major portion), whereas development budget gets a meager share of the resources. The allocations for development purpose in provincial education budgets are meager. 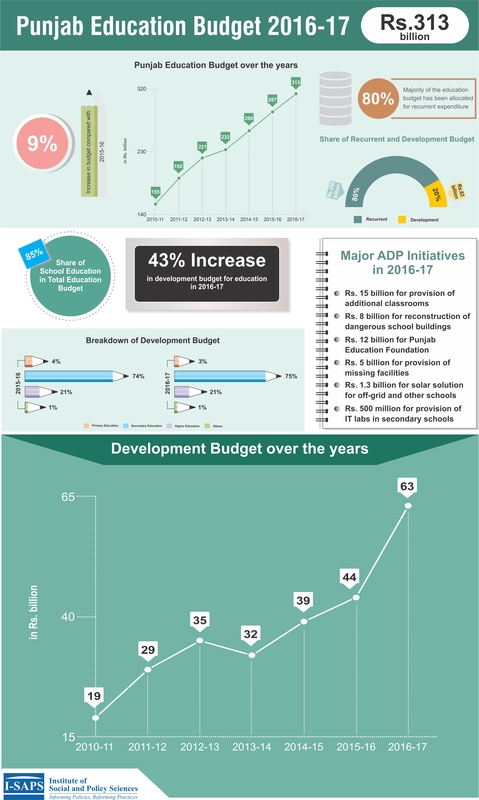 As can be seen from the infographic, even the allocated development budget is not utilized completely is most of the cases. The Incheon declaration urges the governments to allocate at least 4-6 percent of their GDP for education in order to provide universal primary and secondary education by 2030. Currently 19 Asian countries are spending lower than 4 percent of their GDP on education. More than 800 school buildings in Punjab are critically dangerous whereas around 3,800 buildings are partially damaged. 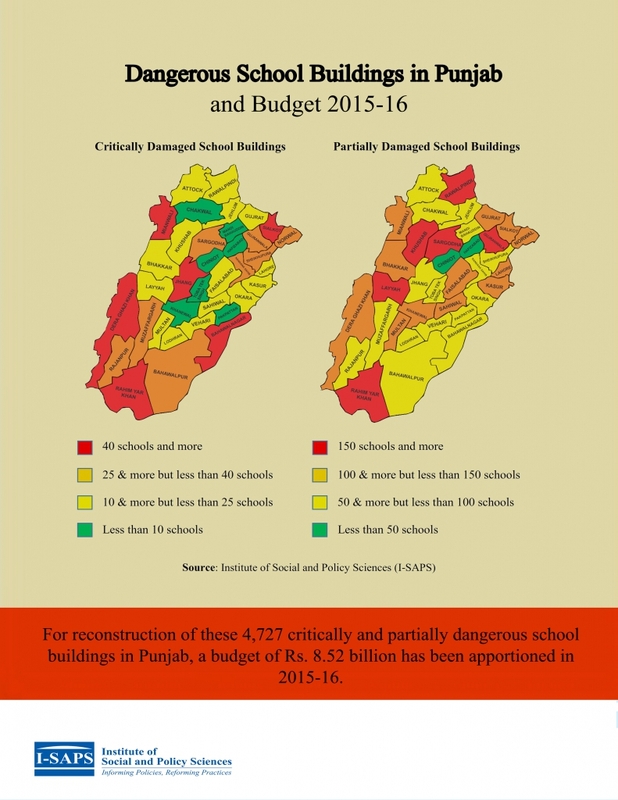 For reconstruction of these 4,727 critically and partially dangerous school buildings in Punjab, a budget of Rs. 8.52 billion has been apportioned in 2015-16. 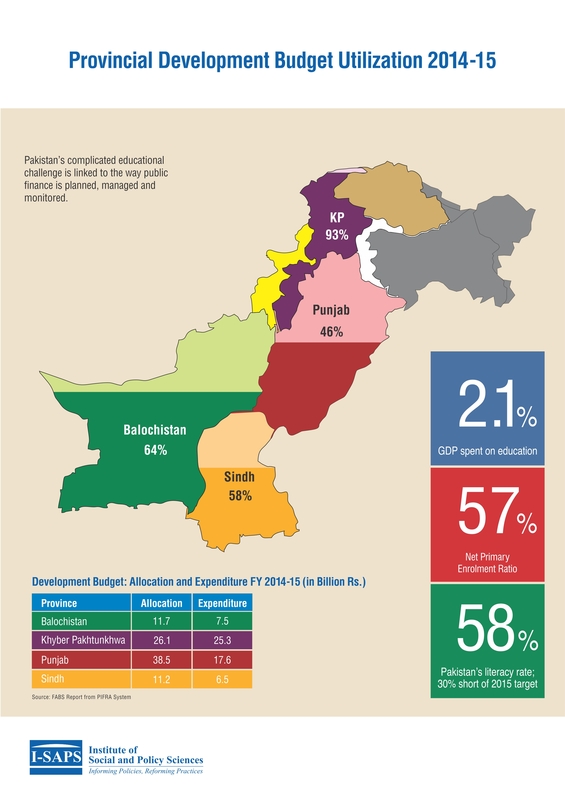 Development budgets receive meager share of the education budgets for all the provinces. Even the allocated development budget is generally not utilized completely. 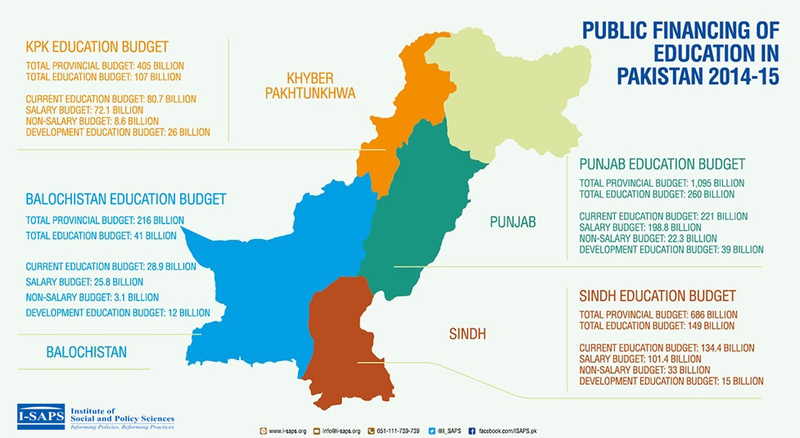 This infograph presents the volume of public education financing in 2014-15 for all the provinces of Pakistan. The education budget is further disaggregated into current and development budget components. 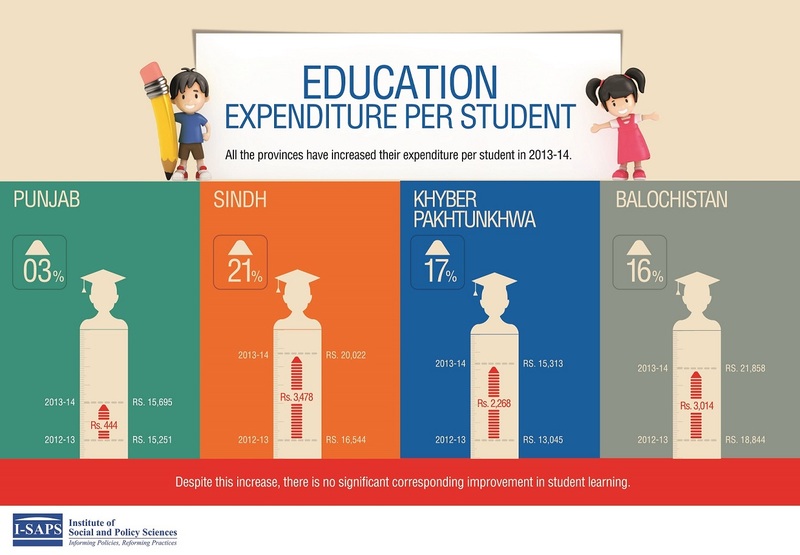 Compared with 2012-13, all the provinces have significantly increased their per student expenditure in 2013-14. However, despite the increase, there is no significant corresponding improvement in student learning. 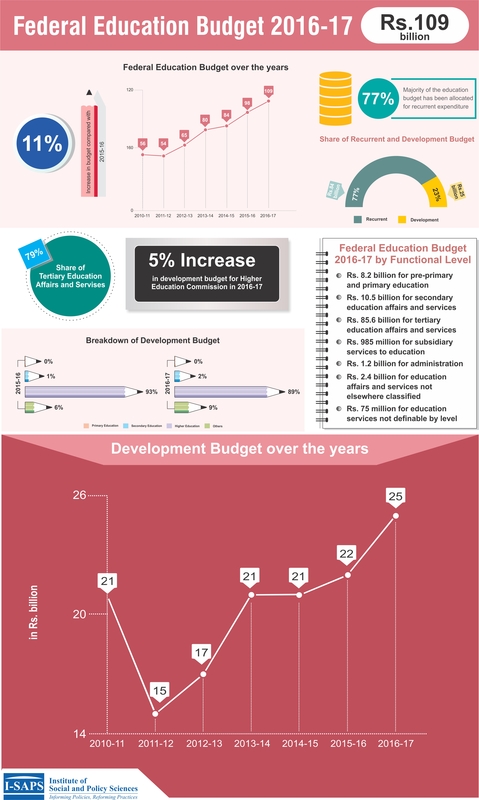 This infograph presents the volume of public education financing in 2014-15 for Punjab. Despite substantial increase in education budget, major portion of it gets absorbed in the current budget whereas there is not much for development purposes. 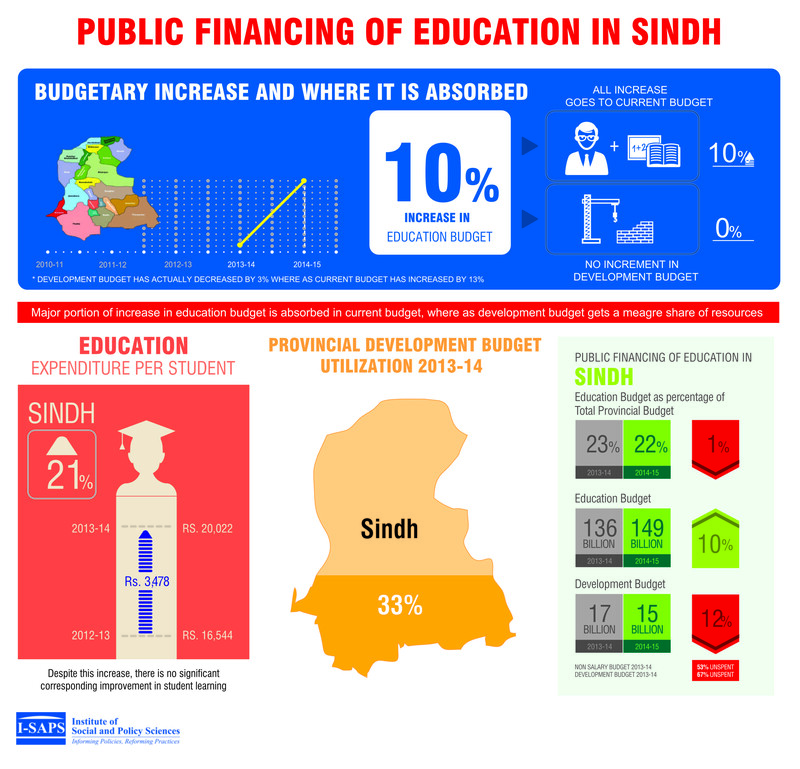 This infograph presents the volume of public education financing in 2014-15 for Sindh. Despite substantial increase in education budget, major portion of it gets absorbed in the current budget whereas there is not much for development purposes. 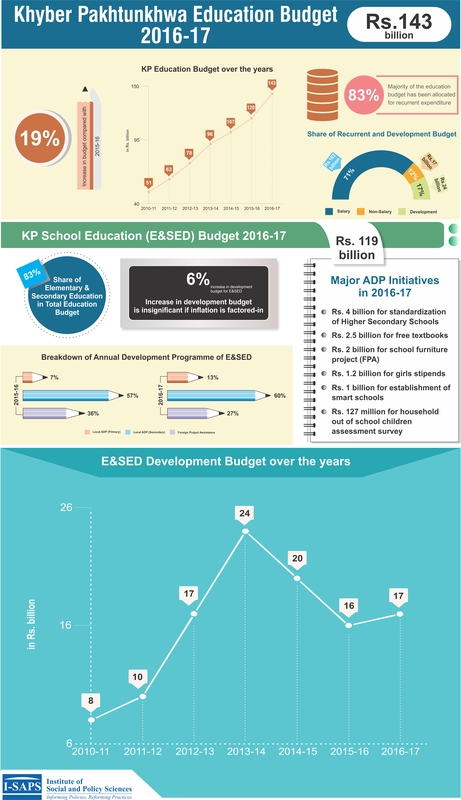 This infograph presents the volume of public education financing in 2014-15 for Khyber Pakhtunkhwa. Despite substantial increase in education budget, major portion of it gets absorbed in the current budget whereas there is not much for development purposes. 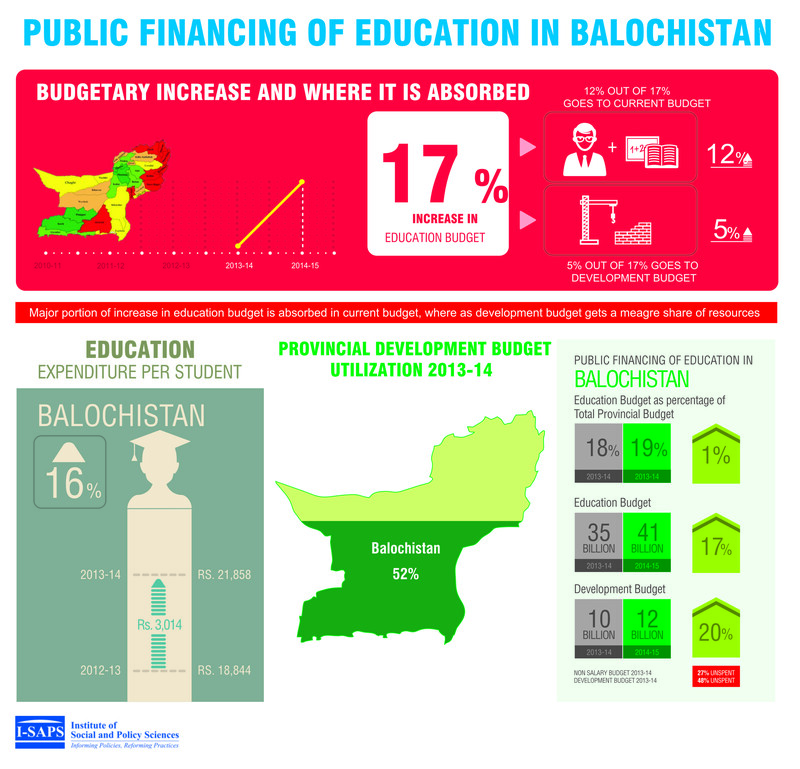 This infograph presents the volume of public education financing in 2014-15 for Balochistan. Despite substantial increase in education budget, major portion of it gets absorbed in the current budget whereas there is not much for development purposes.